Jammu and Kashmir Study Centre: China encroaching on Pakistan-controlled Gilgit-Baltistan? China encroaching on Pakistan-controlled Gilgit-Baltistan? To talk about socialist China and Islamist Saudi Arabia, one has to be cautious in Pakistan! They're brotherly states no-one can criticize them especially in the media. However, everyone is free to accuse and abuse the democratic United States, rather the establishment encourages this engineered collective social behavior in Pakistan. during recent joint-military exercise in Jhelum, Punjab. NO doubt, China is going to be a global phenomenon. The only thing which is damaging its credibility in the world is ban on freedom of expression in the country. If the Chinese government releases writer and Nobel Peace Prize Laureate Liu Xiaobo, and lifts ban from novelist and blogger Han Han, it can win the hearts and minds of the entire world! Cheap goods and aid may not do that what freedom of thought and freedom of expression can do! I'm hopeful the Chinese government will realize it and evolutionary will give way to democracy! That is the only way to be a vibrant part of the global community in the 21st century. In Islamabad, some people close to the government are doubtful about the activities of China in the (Gilgit-Baltistan) region! They’re giving an impression that China is gradually becoming an imperialist power encroaching on foreign territories! 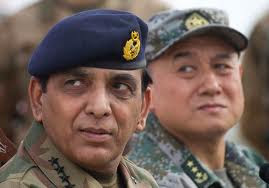 They give the impression that the first military dictator, Gen. Ayub Khan, gifted a large area to China in the 1960s, another dictator, Gen. Zia, lost Siachen Glacier to India in the 1980s and now, when Gen. Kayani calls the shots in the country, Gojal, area-wise the largest tehsil of Gilgit-Baltistan region, had literally gone under the administration of China. I don't know what the fact is? However, publicly there is silence! To talk about socialist China and Islamist Saudi Arabia, one has to be cautious in Pakistan! They're brotherly states no-one can criticize them especially in the media. However, everyone is free to accuse and abuse the democratic United States, rather the establishment encourages this engineered collective social behavior in Pakistan. Some civil society members are also hinting that through relief packages, global powers are trying to win trust of people in the country. I don't believe in conspiracy theories but if a state is not protecting the life and honor of its citizens – heads of different state organs try to get extension in services or keep power within their families – then others would come to fill the blanks! A land needs an owner and people seek basic human rights in the globalizing world. A whole year has passed and yet the government is unable to open the KKH. Similarly, 63 years have passed and so far the Constitution of Pakistan is silent about the legal status of Giglit-Baltistan – the 72,000 sq/km region where people have no basic human rights like other areas of the country. The people say they're Pakistani but the ruling class of the country is unwilling to give the people their due right. My sincere advice to the Pakistani government and establishment is: immediately provide relief to the (landslide) affected people of Gojal and then, through the Parliament, give Gilgit-Baltistan a Constitutional status either as the Fifth Province or an autonomous status like Azad Kashmir. The over two million people of this strategically important region have sacrificed and suffered too much since 1947, now give them relief. After Bangladesh, the fall of Gilgit-Baltistan? Shattered Shangri-La- Lessons For Hunza!